We offer the best in “Turn-Key” solutions for your school’s transportation equipment needs with our full-maintenance lease plans. 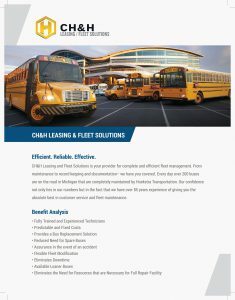 CH&H Leasing and Fleet Solutions is your provider for complete and efficient fleet management. From maintenance to record keeping and documentation– we have you covered. 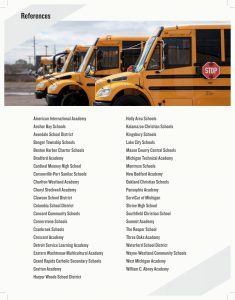 Every day over 200 buses are on the road in Michigan that are completely maintained by Hoekstra Transportation. Our confidence not only lies in our numbers but in the fact that we have over 85 years experience of giving you the absolute best in customer service and fleet maintenance. Charter School? We have great success stories in partnering with Charter Schools to find the transportation solution to fit their specific needs. Call us at 800-248-9951 to learn more about how we can make full maintenance leasing work for your school. Ready to get started?